An Airport Development of 10 Pounds per adult passenger, payabloe at the airport, was introduced in 2007 to help fund the development of the airport. Bus services are available between Norwich airport and the city centre on week days and Saturdays, where there is a rail link to London Liverpool Street. A taxi journey to the rail station would take approximately 20 minutes. Short term car parking is located immediately opposite the terminal building and long term parking is within 300m. 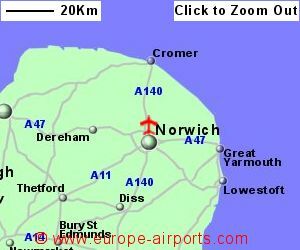 Norwich airport has 4 bars/cafes/restaurants, 2 shops, and a currency exchange/banking facility, an executive lounge, Internet access points and FREE WiFi Internet access. 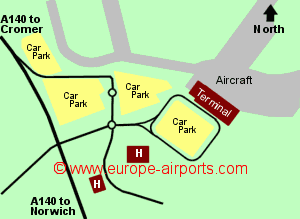 The Norwich Airport Premier Inn and the Holiday Inn are located within 300m of the terminal building. 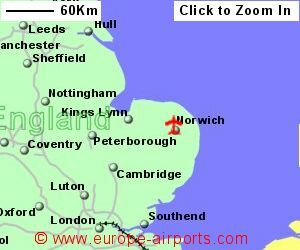 Norwich airport handled 528,000 passengers in 2017, a 4% increase compared to the previous year.